Fiordland Helicopters was formed in the mid-1980s by Kim Hollows. Kim is a pioneer helicopter pilot and highly skilled long-time operator in the venison (deer) recovery industry. He has a lot of stories to tell! Fiordland Helicopters is a New Zealand Civil Aviation approved air transport operator and a member of the Aviation Industry Association of New Zealand. It is, therefore, one of a small number of operators with landing permits within the conservation areas of Fiordland and Southland. We take this privilege seriously and are proud custodians of the landscape. So get off the beaten track. Book your trip today. To provide a safe, efficient service to our clientele, catering to all their flying needs in Fiordland and the surrounding areas. Fiordland Helicopters strives to provide unparalleled expertise, experience and customer service on the ground and in the air. Kim is a skilled pilot with over 30 years’ experience. He has flown throughout New Zealand but has spent most of his air time in the lower South Island and Fiordland. 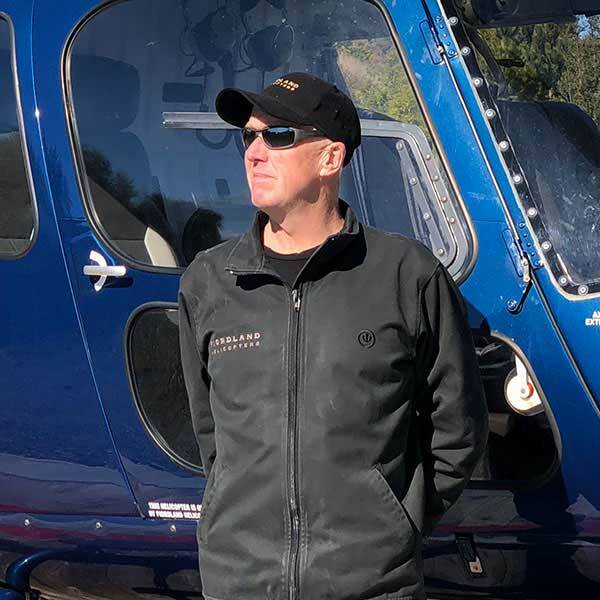 He has been involved in a wide variety of work, including: deer recovery, commercial helicopter operations, filming and photography, work for the Department of Conservation and offering unrivalled scenic helicopter experiences to clients from all over the world. K.E. Hollows Ltd, now known as Fiordland Helicopters, was formed in 1986 to share the beauty of New Zealand with others, particularly the World Heritage area of Fiordland National Park. With Kim’s vast knowledge and passion for this region, he then went on to create the unique film Ata Whenua – Shadowlands. This is a cinematic journey through Fiordland that shows daily at Fiordland Cinema. It is an expression of love for an area that is like no other. Kim is also the founder of the Fiordland Conservation Trust, which was established in 2007. This is a community-driven initiative supporting conservation projects in Fiordland, Southland and New Zealand’s Sub-Antarctic Islands. Mark began his flying career right here in Fiordland 37 years ago. Specializing in wild animal recovery with Alpine Helicopters, he has gone on to work with Kim at Fiordland Helicopters. He is one of Fiordland’s most experienced helicopter pilots. The majority of his flying has been in Fiordland and its surrounds, although Mark has spent a few New Zealand winters flying in Alaska on a wide range of jobs including wild animal capture and research, mineral exploration, mining support, drilling, heavy lifting operations and aerial surveys. His favourite place to fly is around Dusky Sound and along the coast due to the extensive Maori and early European history of this area. 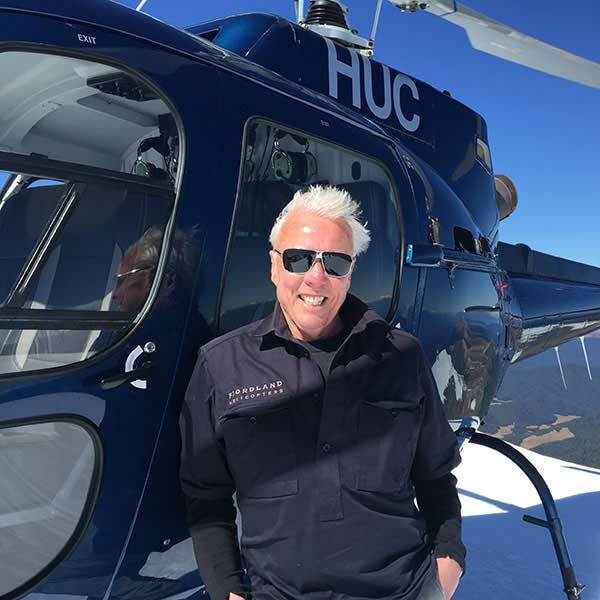 He loves to share his incredible local knowledge with his passengers and we have many testimonials from delighted customers who have experienced the helicopter trip of a lifetime with Mark as their pilot. Fiordland Helicopters, The Cinema Suites in Te Anau, The Black Dog Bar and Fiordland Cinema are all part of Explore Fiordland. All created by Kim Hollows, these local companies work together to provide bespoke Fiordland experiences and exclusive packages that show you the real Fiordland. Many of the experiences provided by us cannot be matched by any other company – this is what makes us a favourite for our clients, many of whom return again and again. You will not be the same when you leave us – the memories and the scenery will stay with you forever. Get in contact with the team today to plan the trip of a lifetime.